I imagine that for many listeners the music presented on this fine BMS CD will be largely new territory. Certainly I have not knowingly heard any of these works before – either on recordings or at recitals. I first came across William Wordsworth on the old Lyrita recording (RCS13) of his Piano Sonata, Op.13 which was coupled with the Cheesecombe Suite, Op.27 and the Ballade, Op.41 (reissued on Lyrita REAM2106). I was very impressed with this music but did not expect to hear much more from his pen. A few years later, about 1986, I was staying at a bed and breakfast in Kirk Yetholm in the Scottish Borders. One wet day the lady of the house allowed me to look at her record collection. Amongst the Delibes and Schubert was an LP of music by Wordsworth. So I had an enjoyable hour listening to the String Quartet Op. 30, the Three Wordsworth Lyrics Op.45 and the Four Lyrics Op.17. The record player was not great, but I got the message: this was a composer I could do business with. Finally, in 1990 Lyrita (SRCD 207) issued the Second and Third Symphonies. These were eloquent and powerful additions to the symphonic repertoire that had lain undiscovered for too long. And then virtually nothing – until this present disc. Two of the composer’s three Cello Sonatas are presented here alongside the Nocturne, Op.29 and the Scherzo, Op.42. I would suggest beginning the exploration of this music with the Scherzo which was written in 1949 at a time when the composer was at his most successful – at least in eyes of the public. This is a short piece that hovers somewhere between Bartok and something a little bit more British. It is a work that places huge demands on both soloists with complex chromatic writing and incisive rhythms. The programme notes point out that there is no trio section as such; on the other hand a long ‘espressivo’ tune ties the work to its British roots. The Nocturne (1946) was originally written for the viola da gamba, but was reworked for cello. The opening bars suggest that this is a reflective and introverted piece. However the middle section becomes much more animated with an intense relationship building up between piano and a cadenza-like line for the cellist. The music calms down and the opening mood is restored. Nevertheless, all is not as it seems. The work does not close with a sense of calm, but with suppressed despair. I would then turn attention to the two cello sonatas. Wordsworth had already composed his Sonata No.1 for cello in E, Op. 9 back in 1937. Unfortunately, this is not presently available on CD. The programme notes suggest that the Sonata No.2 in G minor, Op. 66 is the composer’s most important work for cello and piano. It was composed in 1959, the year that he met Dmitri Shostakovich and it certainly manages to reflect some of the musical thought of that composer. However, I have to disagree with Malcolm MacDonald in his view that this present work is ‘often depressive’ although I agree with him that it is certainly ‘dark-hued’. Certainly, there is no doubt that this is a deeply serious work – yet the Sonata is in a rhapsodic form that balances an unyielding musical force with a strong sense of the lyrical to great effect. Although it is written in a single movement, it is subdivided into three sections with the two outer ones being thematically related. The ‘adagio’ is a different matter. This is much more expressive and is largely introspective, without becoming too disheartening. Scott Goddard, writing in a contemporary review, has suggested, ‘The whole work has the quality of intelligent communication between two interested parties intent of solving a mutually rewarding problem.’ It is a good summary of this fine work that most certainly should be in the repertoire of all cellists. The work was first performed at the Wigmore Hall with William Pleeth and Margaret Good. The last of Wordsworth’s pieces on this CD is the Sonata for Violoncello, Op.70. This was written in 1961 around the time that the composer had returned to Scotland. Compared to the ‘large-scale and strenuous’ G minor Sonata, this is a much more relaxed piece that surely owes more to J.S. Bach than to more contemporary composers. The work is written in a well-balanced three movements with the slow movement being first. Perhaps the most impressive part of this work is the fine ‘allegro scherzando’ which contrasts disjointed melodic phrases with an eerie essay in harmonics. The final bars are complex and involve chords and pizzicato. The third movement opens with a ‘sostenuto’ passage before launching into a ‘rough, acidulated’ jig-like ‘allegro.’ The sleeve notes point out that the final coda reveals this jig as a variation on the sonata’s opening theme. I do not normally get pleasure from music for solo cello, but this Sonata is both enjoyable and often quite moving. Once again it demands recognition: there are other solo cello works that Bach, Britten and Kodály! With Josef Holbrooke’s Fantasie-Sonata the listener has moved into a totally different sound world from William Wordsworth. Brahms is surely a major influence on this ‘big’ work that explores a wide range of emotions and musical moods. The sonata opens with a ‘molto allegro fuoco’ that appears to define the mood. Yet the contrasting subject is much quieter and seemingly represents a lull before the storm. The central ‘adagio’ is truly beautiful: the cello is muted throughout giving a misty ‘Celtic’ mood to the music. But it is the finale that will stay in the listeners mind long after the music has finished. The sleeve-notes suggest that this ‘allegro giocoso con brio’ is ‘like a patter song from an operetta.’ Certainly there are a lot of notes played by both soloists. As in all good music there is an expressive contrasting tune, but this is soon flung aside and the ‘joyful’ tune has its head. The Fantasie-Sonata ends on a hugely positive note. This is a work that appeals immediately: it is romantic music that touches the heart much more than the head. Yet the technical content of this work is certainly impressive. If any work on this CD stopped me in my tracks it was the excellent Suite by William Busch. Busch had been born in London in 1901 of naturalised German parents. His musical teachers included the enigmatic Bernard Van Dieren and John Ireland. He moved in the circle of Alan Bush, Howard Ferguson and Gerald Finzi. Alas, Busch died young in 1945. The sleeve-notes mention his Piano Concerto (1937-38) which has been recorded on Lyrita and coupled with his Cello Concerto (1940-41). Apart from these two masterworks the present CD appears to present the only other examples of his music currently available on disc. The Suite for cello and piano was composed in 1943 and was dedicated to Florence Hooton – who was also the dedicatee of his Cello Concerto. The title of ‘suite’ must not be considered to make this music ephemeral: there is much profound thinking in these pages. In fact, it was the opening ‘Prelude’ that pulled me up sharp. This is music that is both moving and inspiring. Malcolm MacDonald suggests that it is one of the composer’s most eloquent inspirations. The second movement, a ‘Capriccio’, certainly lightens the mood, yet in spite of a touch of sardonic humour, this is not all fun. The composer does seem to create a certain black humour in these pages that reflects the time the piece was composed. The ‘Nocturne’ is pure perfection: this short movement creates a mood of beauty and idyll. Yet there is a valedictory mood to this music: Malcolm Macdonald has noted the ‘crepuscular atmosphere [that] recalls the late chamber works of Frank Bridge.’ The final ‘Tarantella’ in E minor is a romp. Written in compound time this music balances both fun and something just that little bit sinister. It is a perfect conclusion to a great work that is demanding for the players and totally rewarding for the listeners. It is one of my chamber music discoveries of the year … so far. The two short works that close this recital are amongst the very last the William Busch wrote. A Memory was composed in June 1944 and the Elegy the following month. Certainly, the former seems to be both reflective and meditative. The sleeve-notes suggest that it is ‘something of the tranced, nostalgic English-pastoral’ that grows more agitated ‘and ends in a mood of bitter regret...’ This is a perfect miniature that is both heartbreaking, yet somehow positive in its conclusion. A Memory was based on the last song of William Busch’s song-cycle There Have Been Happy Days, which he composed in the early months of 1944 to a text by W.W. Gibson. The Elegy is an altogether more substantial piece than A Memory. It begins with deeply moving ‘adagio molto sostenuto.’ This is largely for the cellist alone. In fact, for a large part of first section of this work, the piano makes only the most sporadic comments. However, the section does build up into a considerable passionate culmination of this slow music before a slightly more relaxed ‘allegretto non troppo’ takes over the proceedings. Malcolm Macdonald points out that this is a variant of the opening statement of the piece, which leads towards another climax before reprising the mood of the opening theme. It is an example of a relatively small work in timescale that contains a wealth of emotion and a depth of character that is largely unexpected. All these pieces are finely played by Raphael Wallfisch and Raphael Terroni, with complete sympathy for the various styles of music presented. From the introversion of Busch through the darker moments of Wordsworth to the sheer romanticism of Holbrooke, the performance is always convincing and well defined. The programme notes, which I have referred to on many occasions in this review, are excellent and are essential to an understanding of these varied works. Finally, if ever there was an advert for three composers, who are largely ignored by listeners and the musical establishment alike, it is this CD. Busch, Wordsworth and Holbrooke are important composers who ought to be understood and enjoyed and appreciated as a part of the British musical canon. This CD goes far in promoting this ambition. William Wordsworth composed a large and varied output of more than one hundred works of which the seven symphonies are the unquestionable backbone. It also includes many chamber pieces such as the six string quartets, sonatas for various instruments as well as piano works. Although it never gained wide exposure Wordsworth’s music was not altogether neglected as far as commercial recordings are concerned. Several works of his were issued during the LP era on various labels such as Discurio, CRD, Jupiter and Lyrita. The Lyrita disc with some piano works is now available again as REAM.2106 and has been reviewed here. The Jupiter LP was transferred several years ago on BMS406 (cassette only). Lyrita also released the Second and Third Symphonies on CD as SRCD.207 - published as far back as 1990 and still available. 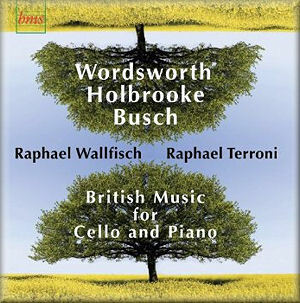 Wordsworth composed several works for cello including two sonatas (Op.9 – 1937 and Op.66 – 1959), a sonata for solo cello (Op.70 – 1961), a couple of shorter pieces (Nocturne Op.29 and Scherzo Op.42 both recorded here) and a substantial Cello Concerto Op.73 (1963). Both Nocturne and Scherzo date from the mid and late 1940s. They are fairly straightforward pieces that never outstay their welcome. The Nocturne is at times somewhat more troubled than its title might imply whereas the Scherzo is particularly brilliant and sometimes brings Shostakovich to mind. The Cello Sonata No.2 Op.66 is a considerably more substantial and serious work. Although in one unbroken movement it obviously falls into three contrasted sections. The music is mostly derived from basic material stated in the slow introduction leading into an Allegro risoluto reaching a climax and then subsiding into the slow section Adagio espressivo. This leads then into the final section combining Scherzo and Finale and recalling earlier material. After a powerful climax, the music ends unresolved. The Sonata for Violoncello Op.70 is another substantial work in three concise movements, although the third one is somewhat more developed. The first movement consists of a long, spiralling melody going through the cello’s entire register, as a single line only opening up into some double-stopping in the final bars. This is followed by a scurrying Scherzo briefly pausing for an eerie central episode in the cello’s harmonics. The final movement opens with a long meditative introduction leading into the final section described by Malcolm MacDonald as “an acidulated jig”. There is no denying that both the Second Cello Sonata and the Sonata for Violoncello deserve to be better known for both are strictly worked out pieces of music though with a clear expressive intent. Holbrooke’s music enjoyed some considerable success in the early years of the 20th Century, fell into some purgatory and seems now to experience revival. He was extremely prolific and composed eight symphonies, concertos and the large-scale operatic trilogy The Cauldron of Annwn as well as a lot of chamber music. The Fantasie-Sonate Op.19 for cello and piano was composed in 1904. As might be expected the music is rhapsodic, often warmly melodic, romantic in feeling and utterly serious even if the final section brings some lighter touches. For many long years all I knew of William Busch’s music was a handful of songs recorded by Peter Pears and Benjamin Britten in a now long-deleted Argo LP. The more recent release of recordings of the Piano Concerto and the magnificent Cello Concerto (Lyrita SRCD.320 reviewed here) considerably broadened my appreciation of his music. Now the present release further contributes to one’s appraisal of Busch’s achievement. The three works recorded here are among his last pieces - composed before his untimely death in 1945. The Suite for Cello and Piano is by far the most substantial of the three. It is in four concise, contrasting movements of which the weightiest is the opening Prelude; it is particularly beautiful. There follows a capricious Scherzo with trio. The short Nocturne that follows achieves much with limited means and is a fine example of Busch’s unsentimental lyricism. The work ends with a brilliant animated Tarantella. A Memory, written for Elizabeth Poston, is a beautiful deeply-felt miniature whereas Elegy is somewhat more weighty, eloquent and deeply moving in spite – or because – of its concision. Wholehearted and committed performances from Raphael Wallfisch and Raphael Terroni make the best of these neglected but often beautiful works which deserve to be better known. Their immaculately played readings present the perfect blend of technique and musicality, and they are well served by a warm, natural recorded sound. I also want to say a final word about Malcolm MacDonald’s excellent and well informed notes. They are a model of the genre. All in all, this is a generous release in every aspect. First of all a declaration of interest. I am a life member of the British Music Society and the editor of the Society's quarterly newsletter. This BMS disc is the second to focus on works for cello and piano. The first was British Music Society BMS423CD and is still the only recording of Foulds’ truly remarkable and exciting Cello Sonata of 1905. The other works featured include the sonatas by Ernest Walker and York Bowen. The performances by Jo Cole and John Talbot are of exemplary commitment. Wordsworth was a descendant of the brother of the poet William Wordsworth. The disc sets out with an uncompromisingly serious statement in the shape of Wordsworth’s single movement, quarter-hour Sonata No. 2 for cello and piano. It dates from 1959 when he met Shostakovich during a British Council-sponsored artistic visit to the USSR. It's part Philippic and part meditation on dark emotions all gauntly expressed and rhetorical. Wordsworth's 1946 Nocturne has a singing line for the cello over an hypnotic triple-note ostinato for the piano. It's a lovely piece that put me in mind of the quieter moments of Rubbra's blessedly impassioned Soliloquy. While the Sonata No. 2 never reminded me of Shostakovich the gawky glitter of the Scherzo recalled the Russian composer and yet the work it reminded me of Piano Concerto No. 2 lay a decade in the future when this Scherzo was written. The op. 70 Sonata is for solo cello. It is in three short movements. These are serious but roundedly Bachian. They traverse a different mindscape from the op. 66 work. The chugging Allegro scherzando second movement follows the Bachian cantabile of the first movement and the cantabile and guitar-pizzicato riches of the final Sostenuto. This finale closes with a rhythmically accented allegro. This represents a mature and satisfying musical experience with a refreshing effect and an old-fashioned glossary. Now Malcolm Macdonald in his liner-essay has whetted my appetite to hear Wordsworth's unperformed massive oratorio Dies Domini 1942-44 - a work seemingly praised by RVW. A total contrast comes in the shape of the Holbrooke Fantasie-Sonate which is superbly mellifluous. Previously I had only heard a 1950s broadcast of the piece in pallid sound. Wallfisch and Terroni really lift the work off the page and make it sing in all its Dvorákian freshness and winged spirit. It was written early in the century. Its tracked in a single movement reflecting its presumed origins in the Cobbett competitions of the early twentieth century. Its finale makes playful use of a jaunty theme which perhaps has a touch of the music-hall about it. It ends with real panache superbly carried off by Wallfisch and Terroni. The notes are good save for a reference to Holbrooke's operatic cycle as the Cauldron of Annwyn. It is the Cauldron of Annwn; the number of times this error is committed! Holbrooke was supported financially by Lord Howard de Walden from circa 1907 until 1946 when Lord Howard sponsored two largely-Holbrooke concerts in London with the LSO and Arthur Hammond. It is perhaps worth adding that Holbrooke himself, from 1902 to the late 1930s, mounted many chamber music concerts including the music of other British composers. Busch was a student of Backhaus and Petri. His Suite comprises: Prelude, Capriccio, Nocturne and Tarantella. The Prelude is confident and sturdy while the Capriccio is all over the place in terms of mood-swings - mad and moony. The Nocturne is ghostly and quietly and insidiously macabre yet enigmatically bestowing calm. The finale's joyous progress occasionally recalled his teacher Alan Bush in his puritan green-sward pleasures. A Memory was written for Elizabeth Poston. It is a plangent cantabile in a deeply introverted pastoral English tradition crossbred with a sort of Dvorak-accented voice. Elegy was premiered by William Pleeth, the teacher of Jacqueline Dupré, in a BBC broadcast in December 1944. It represents a further turning inwards - a trend towards increasing reserve with the odd Elgarian echo. There are also some grand rhetorical statements. The Busch Elegy brings to a close a collection that is generous of heart, superbly re-imagined out of an absence of performing tradition, amply timed and lovingly annotated. I hope we can look forward to some unique orchestral releases from a Society that is confidently spreading its wings. A collection that is generous of heart, superbly re-imagined out of an absence of performing tradition, amply timed and lovingly annotated.